Before I had chickens of my own, I didn’t think too much about eggs. I took it for granted that if I needed them, they were only as far away as the nearest grocery store. Once there, I’d find the perfectly formed, bright white chicken eggs waiting for me. I could buy as many as I wanted. Isn't this beautiful? Certainly not like the kind found in the grocery store! But then I got chickens and my whole world view changed. I think it started with hand feeding baby chicks and watching them grow daily before my eyes. Then, feeding and caring for my girls for months (6 to be exact) before I found the first precious egg laying in the nest. It took almost two weeks to get the first dozen eggs from my young hens. 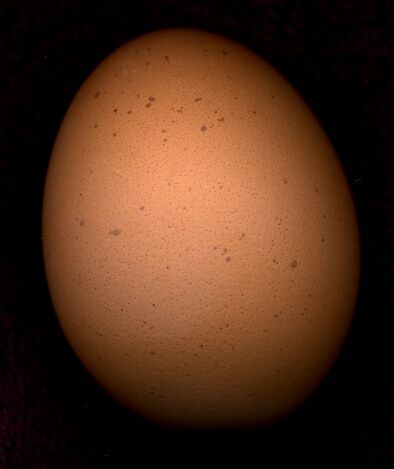 The eggs started out tiny, cute and of varying shades…white, brown, pinkish brown, tan, brown with darker brown spots. Each day brought a surprise…how many eggs would we find, what colors would they be…and we also watched them grow to ‘normal’ egg size over the course of a few weeks. A dozen eggs from the girls in the backyard! I have to admit, at first I felt pretty guilty stealing those chicken eggs…all that hard work (I mean, can you imagine laying one of those every day? )…but yes, I eventually got over it! I’d heard that nothing compares to fresh eggs. Since I already bought cage-free chicken eggs, I had my doubts that I could tell a difference. I set up a taste test for myself, frying two eggs: One store bought cage-free egg and one fresh from the backyard. And it’s true! The fresh egg tasted much richer. It also looked and felt healthier–from the harder-to-crack shell to the bright yellow yolk. I love the variety. No more just white eggs for me! 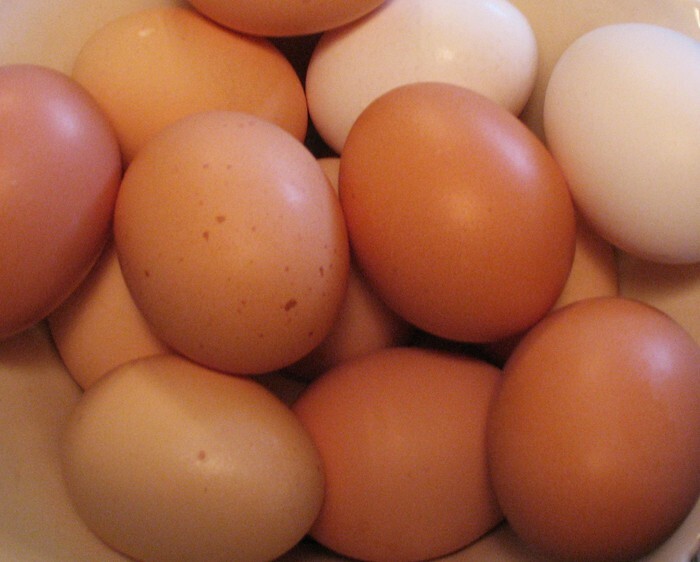 Currently our egg production is between 4 to 7 eggs daily from our 9 hens. Enough of a production that we can finally sell some to help pay for all that chicken food they eat constantly. I decided that starting January 1st, I’m going to keep track of the eggs I get, and also the money I get from selling them, to see how much it really costs to have those fresh eggs from the backyard. I’ll keep the tally on this blog so you can see the totals, too. I’m pretty sure they aren’t going to pay for themselves, but I still wouldn’t trade them, the entertainment they give, nor the beautiful, delicious eggs we are blessed with daily. Put butter in an oven proof frying pan (or in a 8×8 casserole dish, if you don’t have a frying pan that works). Set pan in oven at 425 degrees, on a rack slightly above center. Let butter melt. Mix eggs, flour, sugar and milk in blender until smooth. Remove pan from oven, tilt to coat bottom of pan with melted butter. Pour batter in. Bake until puffy at edges and golden brown, about 15 minutes. Quickly cut into wedges (or squares, depending on kind of pan you’re using). Place on plates and sprinkle liberally with powdered sugar and squeeze lemon juice over top.